Civil War reenactors and living historians gathered at Center Church in the heart of Windham on a beautiful summer afternoon to share their passion for history, and to commemorate the 150th year of the Civil War during the 15th Annual Civil War Heritage Music Gathering and Encampment. The Windham Chapter contributed funds to the event. “This event gives the community a chance to see what life was like during the Civil War,” Civil War Heritage Music Gathering and Encampment Co-Organizer John Quinn said. Visitors could see demonstrations, living history presentations, and music, he said. 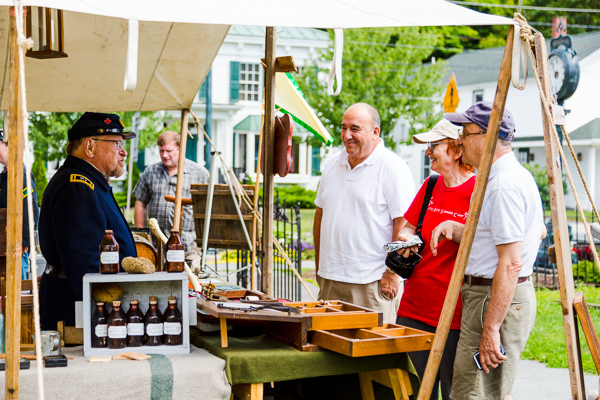 The reenactors love sharing their passion for life during the Civil War with the public, and they have all found niches where they are particularly knowledgeable. A long time reeneactor, Kopecky, started doing Civil War reenactments a few years ago when the 150th Anniversary of the Civil War year began in 2011. He believes people must learn about history so they can avoid making mistakes that leaders made in the past. “War should be the last choice,” he said. “Every veteran or military historian will tell you that.” Besides learning about the past, he sees living history events as a chance for people to escape the virtual world that consumes many lives in 21st century. “It gives people a chance to look up from their phone, and see something real,” he said.